The Callaway Golf Solaire 9-piece Complete Club Set is an all-in-one set designed exclusively for women. Callaway, a top golf brand with endorsements by pro golfers like Arnold Palmer and Annika Sorenstam, has put its years of research on the nuances of a woman’s swing into this club set. 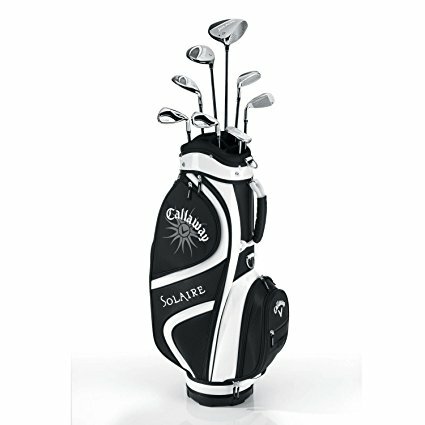 Considered by many to be the ideal starter set, the Callaway Solaire Club Set has received excellent reviews for its performance and handling. The Callaway Golf Solaire 9-piece Complete Club Set features has become the go-to product for beginner and intermediate women golfers. One of the set’s most important features is its Energy Efficient Design, a way to use materials and design elements to make the best use of each piece for optimized play. This complete club set features a driver, #5 steel, #6 hybrid, #7 hybrid, #8 iron, Pitching Wedge, Sand Wedge, mallet putter, and cart bag. Each of the irons, hybrid, and driver features the Callaway Solaire Graphite shaft with lighter weighting designed especially for women. Focused on performance, but not without style, the Solaire Club Set gives women golfers the tools to achieve greater distance and more precise hits out on the golf course. Overall, reviews have applauded the diversity of the set, lightweight feel, versatility of the golf bag, and performance on the course.